Most people will instantly recognise this location as both buildings are still on the High Street and surprisingly unchanged. Here we see Alec Norman (and his dog.) 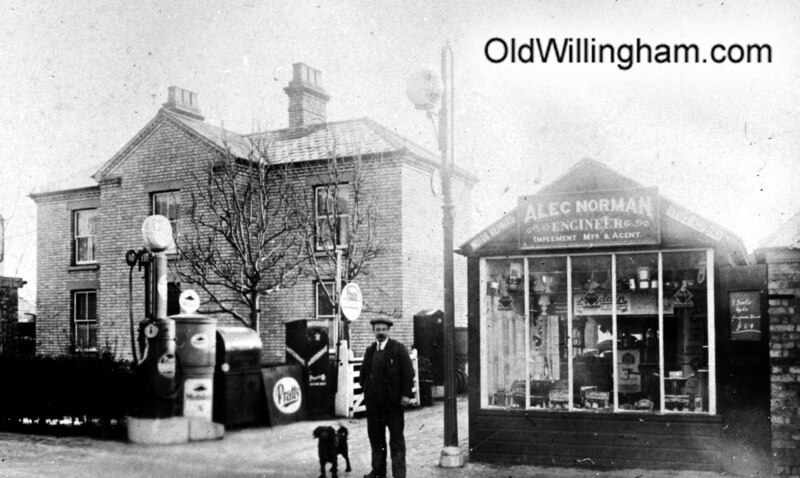 Mr. Norman was well known in the village for general repairs. He originally had a workshop at Fen End but moved to this larger premises. To his right are petrol pumps (and probably also paraffin.) The pump is selling “Pratts” petrol which was one of the major suppliers until 1935 when the name was change to Esso (literally ‘S’ and ‘O’ from the parent company Standard Oil.) You might think the little shop would contain car parts but, zooming in on the photo, we see that the window display is radio sets and lamps. Alec had diversified into the wireless business. This picture probably early 1930s.